The 740 Heinz commercial project is a 110,000 SF state-of-the-art life science research and development building. 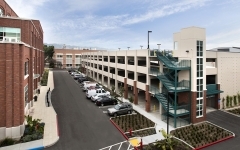 Located in the Aquatic Park Center, the 18-acre, 17-building urban research and development campus is home to Siemens Diagnostics, Caribou Biosciences and alternative energy company LightSail Energy, an on-site child care facility, cafes and restaurants. 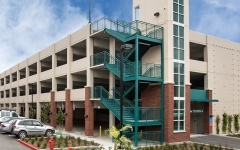 The 710 Heinz Parking Garage was built in conjunction with the 740 Heinz Avenue building. It is located in a high volume pedestrian area that links businesses to the south and west of the park. 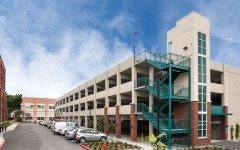 The garage is four levels and includes spaces for 282 cars. Bio planters to the north and west of the garage removes pollution and runoff water feeds two larger planters at the east and west sides. Also included in the development is an on-site child care facility, cafes and restaurants.